Showing items in category Victoria, sorted by newest listed first. AUSTRALIA (Victoria) - 1857 6d rate local cover. 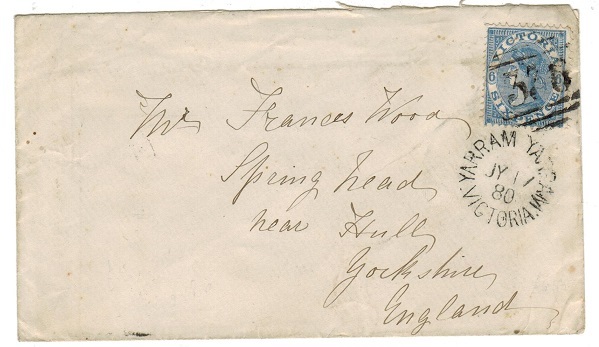 1857 cover to Sydney bearing 6d Orange-yellow (SG 53b) tied by '1' duplex of Melbourne with fine black SHIP-LETTER/SYDNEY b/s dated JA.8.1858. Scarce early cover. 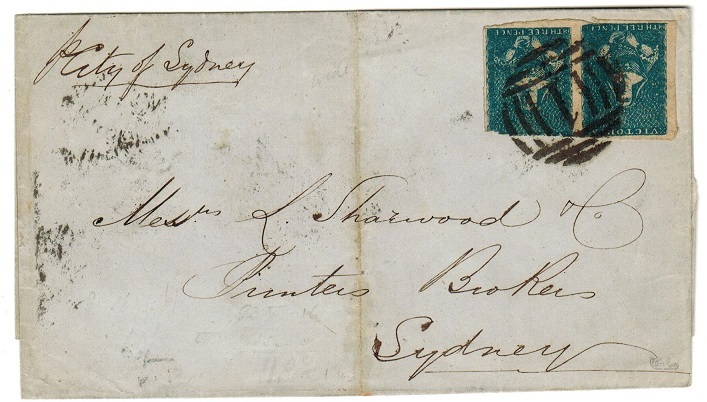 AUSTRALIA (Victoria) - 1856 6d rate 'half length' cover used locally. 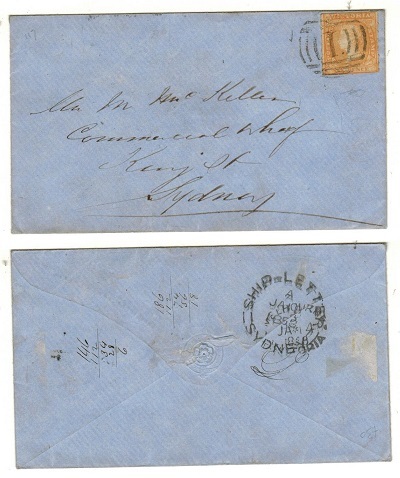 1856 outer wrapper addressed to Sydney bearing a pair of the half length 3d steel blue adhesives (SG 31) tied by superb '1' duplex. One stamp cut into at top edge. 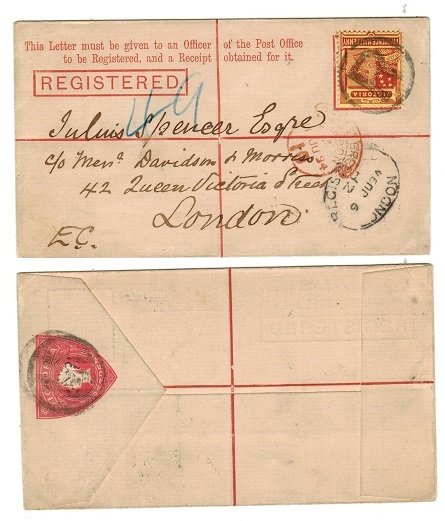 Oval MELBOURNE/ VICTORIA b/s dated NO.24.1856 and SHIP LETTER/SYDNEY strike of four days later. Central fold and marked 'Per City Of Sydney' in manuscript at top left. 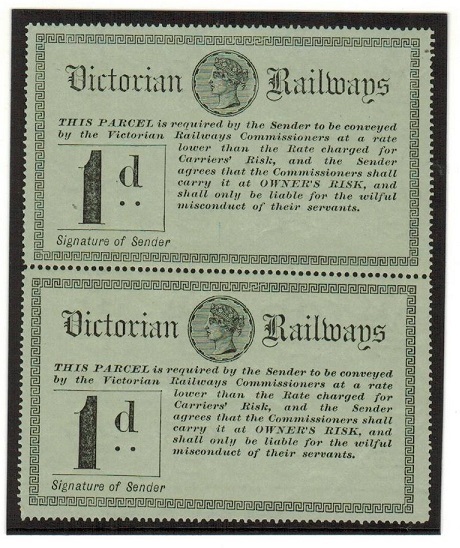 AUSTRALIA (Victoria) - 1887 1d 'VICTORIA RAILWAYS' mint adhesive pair. 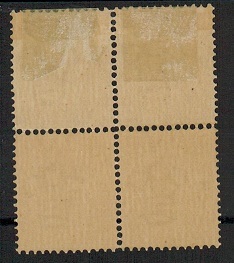 1887 black on green '1d VICTORIA RAILWAYS' perforated parcel adhesive in a very fine vertical mint pair with full gum. A scarce and attractive multiple of this issue. Robson Lowe type R4. AUSTRALIA (Victoria) - 1882 1/2d plum 'VICTORIA RAILWAYS' adhesive mint pair. 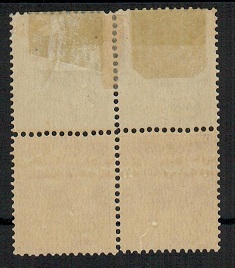 1882 1/2d dull plum red 'VICTORIA RAILWAYS' perforated parcel adhesive in a very fine vertical mint pair with full gum. A few perforation faults but a scarce and attractive multiple of this issue. Robson Lowe type R3. 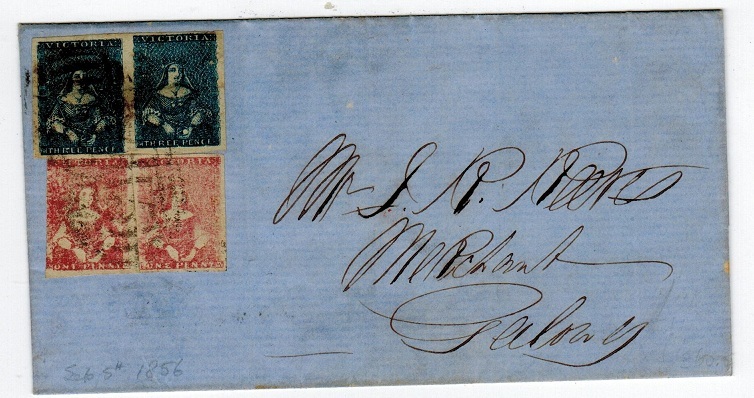 AUSTRALIA (Victoria) - 1862 4d rate local cover used at GEELONG. 1862 (NO.1.) entire addressed to Melbourne bearing 4d dull rose adhesive (SG type 9) tied by '2' duplex with GEELONG cds alongside. 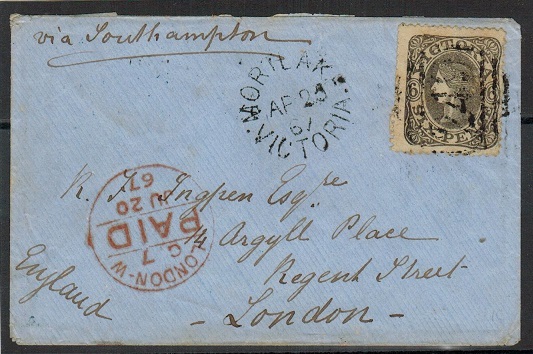 AUSTRALIA (Victoria) - 1890 6d rate cover to UK used at MARYBOROUGH. 1890 (JA.30.) 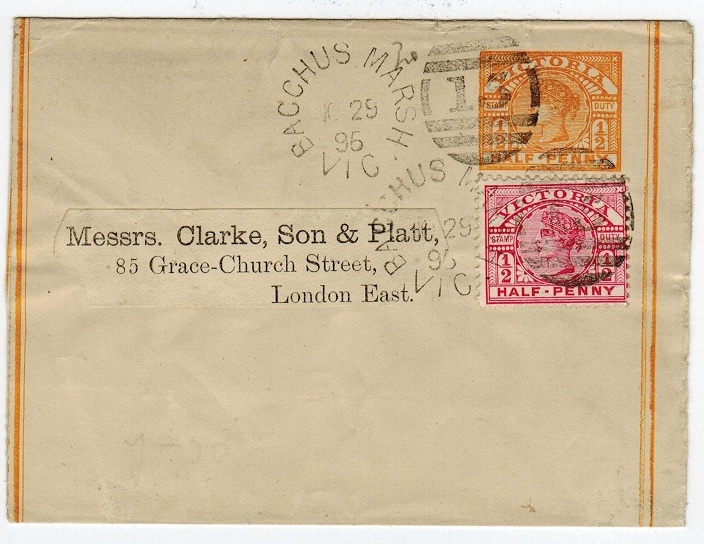 cover addressed to UK bearing 6d adhesive tied by '61' duplex with proving MARYBOROUGH/VICTORIA cds alongside. 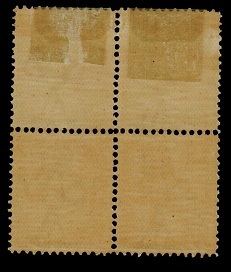 AUSTRALIA (Victoria) - 1867 'POSTMARK' range of some 317 2d adhesives (SG 132 a-i). 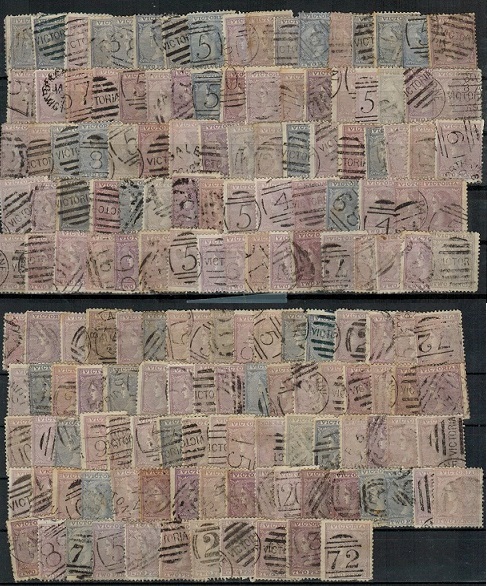 1867 range of some 317 examples of the 2d (SG 132 a-i) arranged on four black stock cards with an array of shades and cancellations. Many duplex numbers for the specialist. 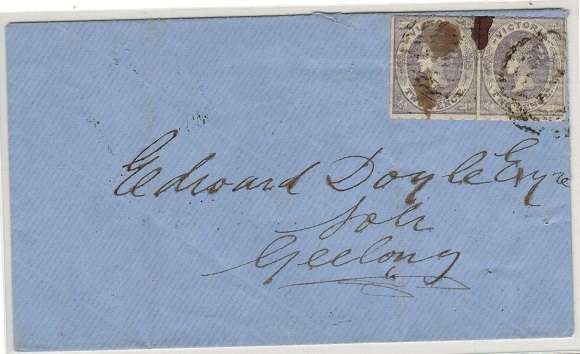 AUSTRALIA (Victoria) - 1860 4d rate cover addressed locally to Geelong. 1860 (AU.24.) 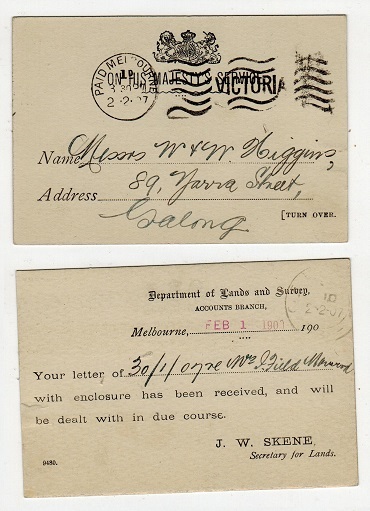 cover addressed locally to Geelong (light vertical bends) bearing a pair of the 2d pale lilac 'emblem' adhesives (SG 47) tied by somewhat smudged cancel but with MELBOURNE/D b/s and GEELONG/VICTORIA arrival cds. 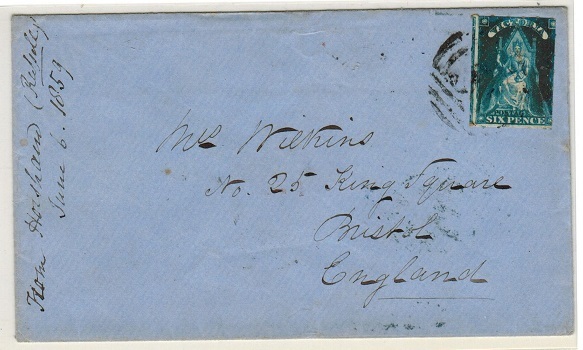 AUSTRALIA (Victoria) - 1859 6d blue 'full length' cover to UK. 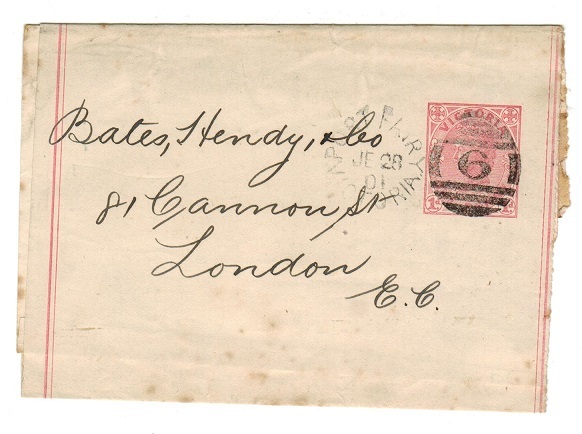 1859 cover addressed to UK bearing 6d 'full length' adhesive (SG 43 rouletted) cancelled by duplex cancel with oval HORSHAM crowned b/s and MELBOURNE transit dated 13.JUL.1859. BRISTOL arrival of AUG 9th. Clean cover. AUSTRALIA (Victoria) - 1924 'Ludwig' blue PROOF of the 'Queen on Throne' issue. 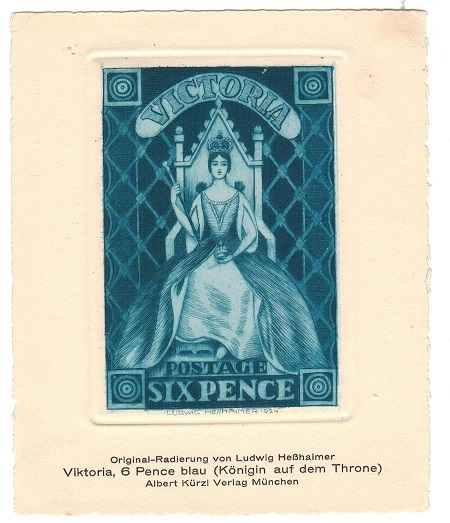 1924 'Ludwig' proof of the 'full length Queen On Throne' 6d issue (SG type 2) printed in deep rich blue on recess card and numbered '572' on reverse side. (117x142mm). 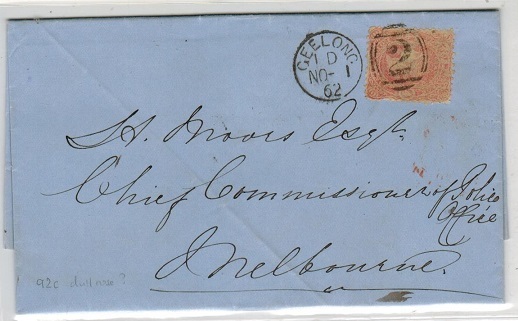 AUSTRALIA (Victoria) - 1884 2d rate cover addressed locally from MELBOURNE. 1884 'Grand Hotel' monogrammed envelope addressed to His Excellency Sir W.Robinson at Adelaide bearing a fine vertical pair of the 1d apple green (SG 209b) tied by VICTORIA barred duplex with MELBOURNE DE.22.84 cds alongside. GPO.ADELAIDE/SA arrival. AUSTRALIA (Victoria) - 1893 3d red RPSE uprated to UK. H&G 10. 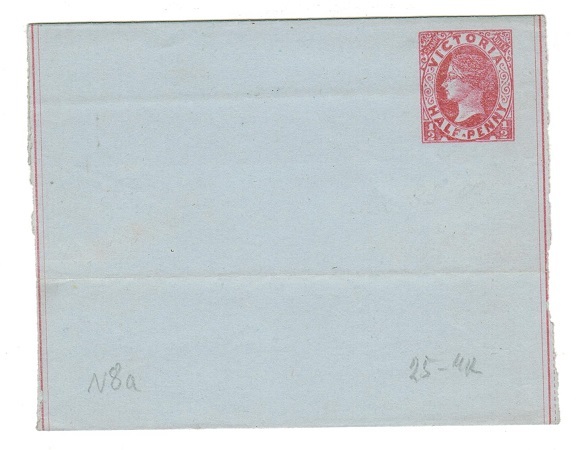 1893 3d red orange on cream laid paper registered postal stationery envelope addressed to UK bearing 2 1/2d adhesive tied by oval 'R' h/s with red hooded REGISTERED/LONDON and black oval REGISTERED/LONDON arrival cancel dated 9.JU.94. H&G 10. 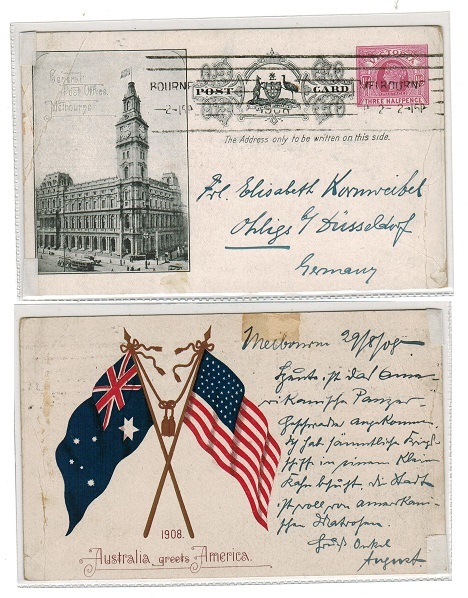 AUSTRALIA (Victoria) - 1908 1 1/2d 'American Fleet' PSC to Germany used at MELBOURNE. H&G 31. 1908 1 1/2d red-brown 'American Fleet' postal stationery postcard addressed to Germany (edge creases) cancelled by barred MELBOURNE roller cancel used on 29.8.08. A very rare piece of stationery rated 'RRRR' by H&G. H&G 31. 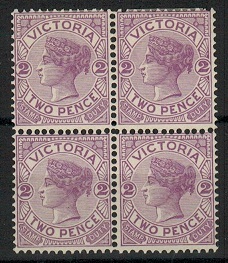 AUSTRALIA (Victoria) - 1891 1 1/2d on 2d violet PSC to UK used at MELBOURNE. H&G 12. 1891 1 1/2d Red on 2d violet on grey postal stationery postcard ovpt'd in red UNIVERSAL POSTAL UNION addressed to UK & cancelled MELBOURNE & dated FE.9.92. H&G 12. AUSTRALIA (Victoria) - 1861 6d rate cover to UK. 1861 (JUN.21.) 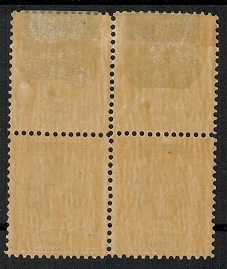 cover addressed to UK bearing 6d dark blue 'Queen on Throne' adhesive tied by horizontal bars in vertical oval cancel. MELBOURNE transit b/s dated AP.25.61 and MORPETH arrival. AUSTRALIA (Victoria) - 1901 3d red-orange RPSE unused. H&G 10. 1901 3d red-orange registered stationery envelope in fine unused condition. H&G 10. AUSTRALIA (Victoria ) - 1900 1d grey 'Commonwealth' PSC unused. H&G 23. 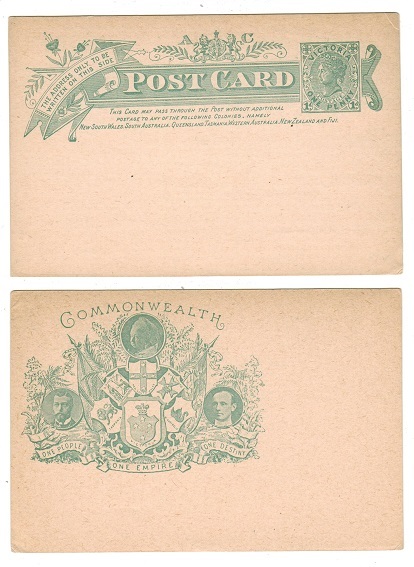 1900 1d Grey green on cream 'Commonwealth of Australia' postal stationery 'view' commemoration postcard in fine unused condition. H&G 23. AUSTRALIA (Victoria) - 1900 1d ochre 'Commonwealth' PSC unused. H&G 23. 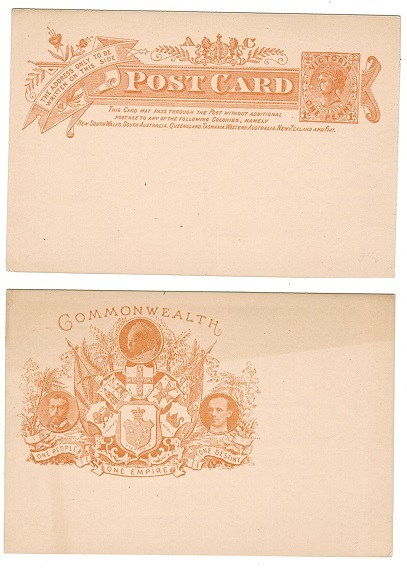 1900 1d ochre on cream 'Commonwealth of Australia' postal stationery 'view' commemo- ration postcard in fine unused condition. H&G 23. AUSTRALIA (Victoria) - 1900 1d blue 'Commonwealth' PSC unused. H&G 23. 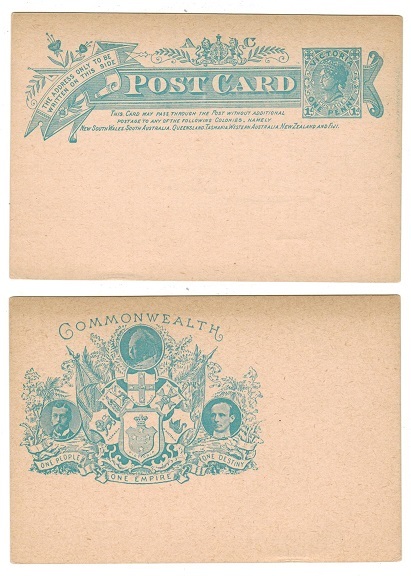 1900 1d blue green on cream 'Commonwealth of Australia' postal stationery 'view' commemoration postcard in fine unused condition. H&G 23. 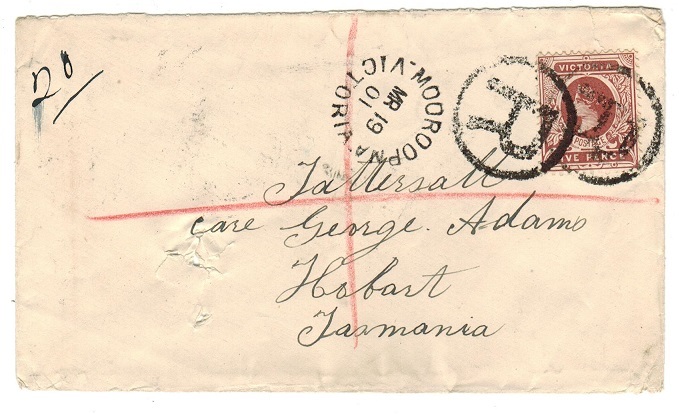 AUSTRALIA (Victoria) - 1901 registered cover to Tasmania with 5d tied MOOROOPMA. 1901 (MR.19) cover to Tasmania (spike hole at left) bearing 5d pale reddish brown adhesive (SG type 70) tied by oval 'R' h/s with superb crisp MOOROOPMA/VICTORIA cancel alongside. AUSTRALIA (Victoria) - 1903 postcard to USA used at WILLIAMSTOWN. 1903 (SE.4.) 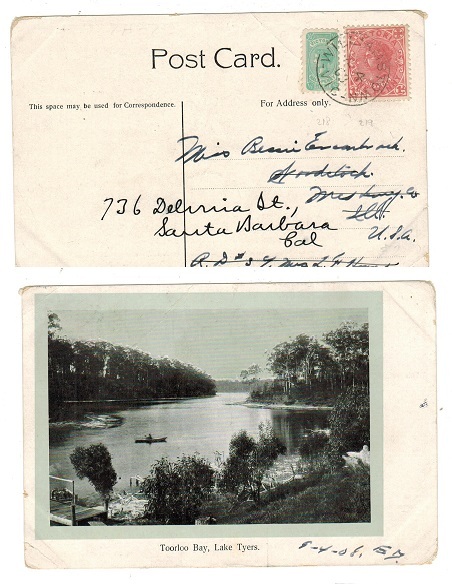 use of picture postcard addressed to USA depicting 'Toorloo Bay, Lake Tyers' bearing 1/2d and 1d adhesives tied by WILLIAMSTOWN/VIC cds. 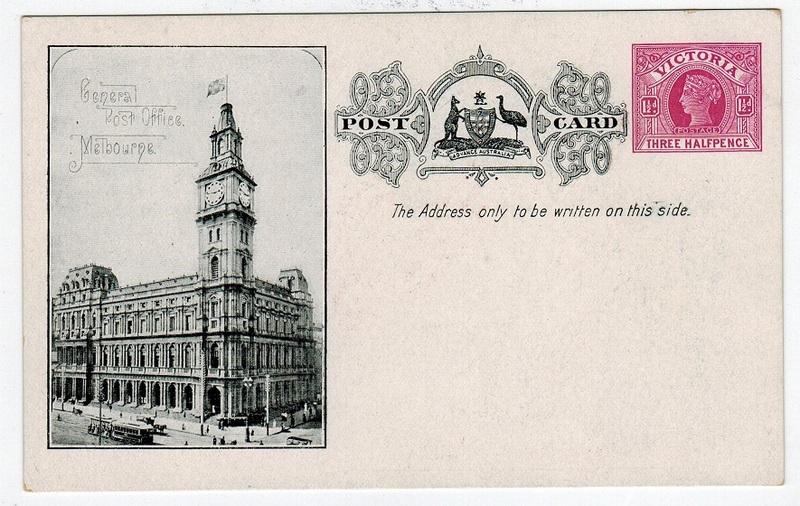 AUSTRALIA (Victoria ) - 1907 OHMS stampless postcard with PAID MELBOURNE cancel. 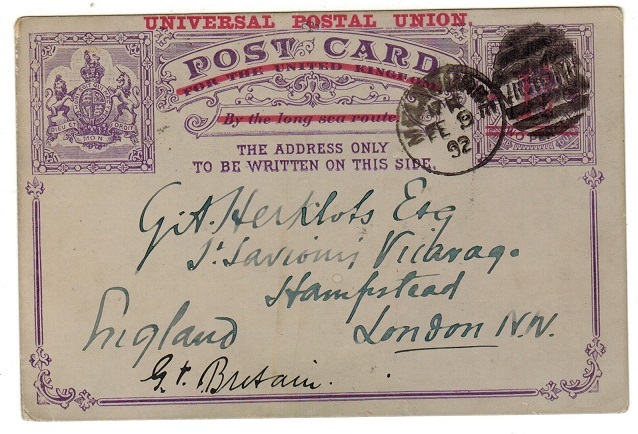 1907 (2.2) use of stampless ON HIS MAJESTY'S SERVICE postcard for use by the department of lands & survey. Addressed locally & cancelled by PAID MELBOURNE wavy lined cancel. Scarce. 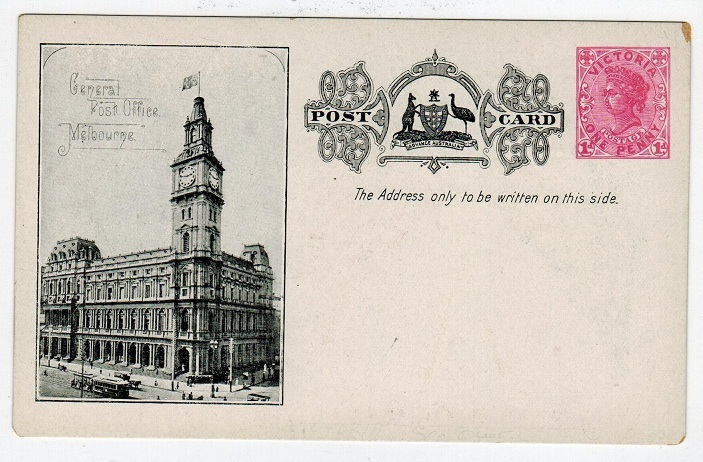 AUSTRALIA (Victoria) - 1905 inward postcard with 1d and 2d 'Postage Dues' added. 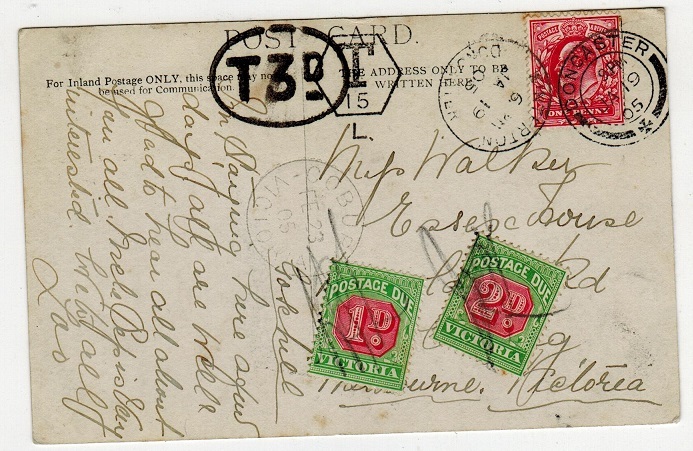 1905 inward postcard from UK with COBURO/VICTORIA arrival cds dated FE.23.05 & being underpaid having oval 'T3d' tax mark applied & with 1d & 2d 'Postage Dues' added (SG D27 & 28c) tied by manuscript pencil initials. 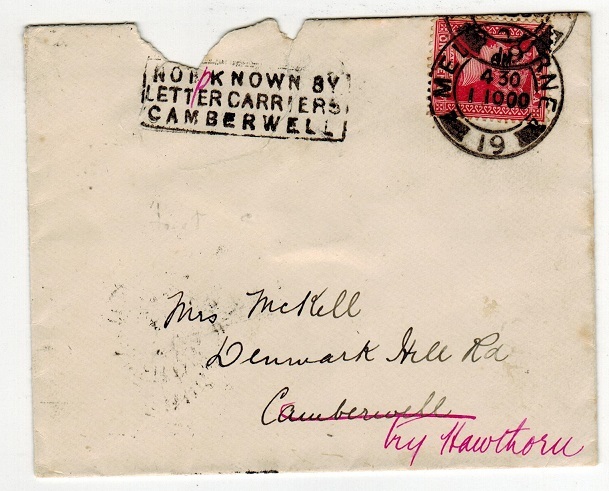 AUSTRALIA (Victoria) - 1900 NOT KNOWN BY/LETTER CARRIERS/CAMBERWELL cover. 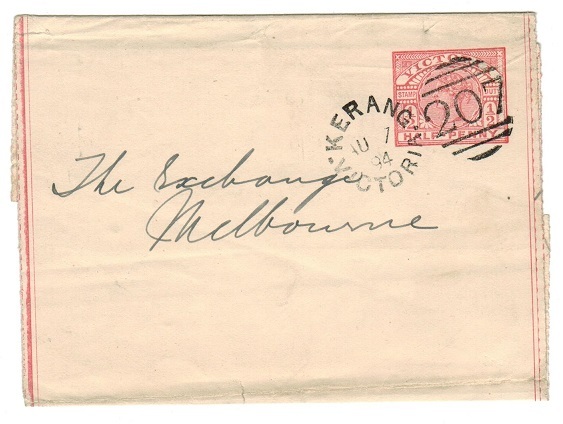 1900 cover addressed locally to Camberwell and then re-directed to Hawthorn bearing 1d adhesive tied by MELBOURNE/19 cds. 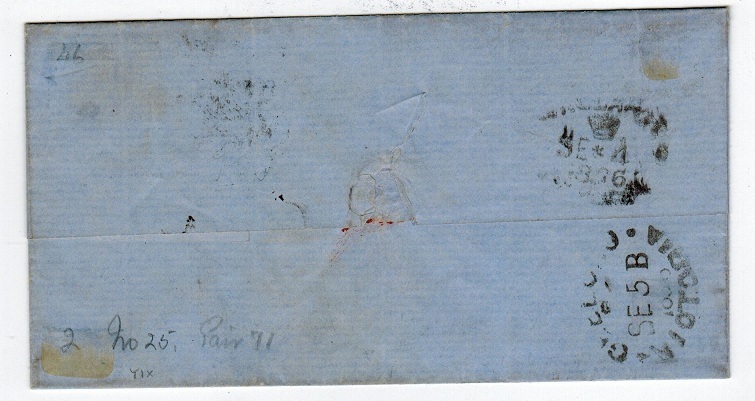 Unfortunately ripped at top left with a small part of the reverse flap missing but struck on the front by black boxed NOT KNOWN BY/LETTER CARRIERS/CAMBERWELL instructional handstamp. 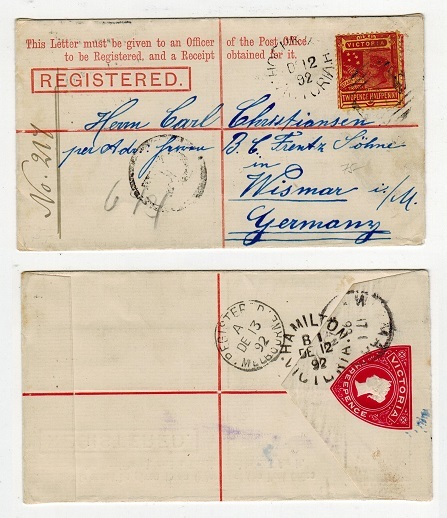 AUSTRALIA (Victoria) - 1891 3d RPSE uprated with 2 1/2d to Germany and used at HOCHKIE. H&G 7. 1891 3d carmine on cream registered postal stationery envelope addressed to Germany bearing additional 2 1/2d adhesive tied by duplex cancel with HOCHKIE/VICTORIA cds dated DE.12.92 alongside. H&G 7. 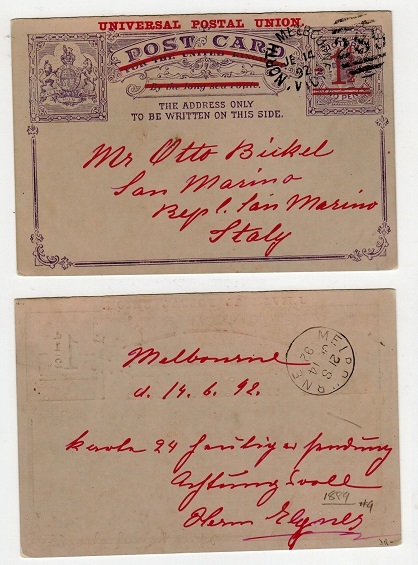 AUSTRALIA (Victoria) - 1891 1 1/2d on 2d PSC to Italy used at MELBOURNE. H&G 12. 1891 1 1/2d red on 2d violet on grey postal stationery postcard ovpt'd in red UNIVERSAL POSTAL UNION addressed to Italy & cancelled by '289' duplex with MELBOURNE cds alongside dated JE.14.92. H&G12. AUSTRALIA (Victoria) - 1889 3d PSC unused. H&G 10. 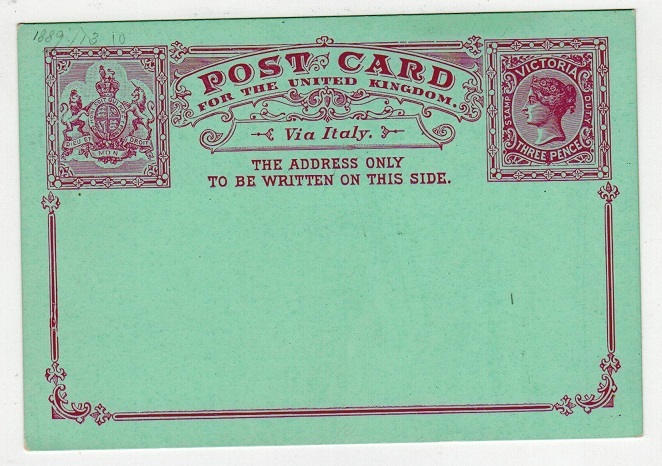 1889 3d Carmine on light green postal stationery postcard. Fine unused. H&G 10. AUSTRALIA (Victoria) - 1899 1/2d emerald postal stationery wrapper used at PORT FAIRY. H&G 19. 1899 1/2d Emerald on white postal stationery wrapper addressed locally & bearing additional 1/2d adhesive tied PORT FAIRY & dated DE.19.99. H&G19. AUSTRALIA (Victoria) - 1901 1d rose postal stationery wrapper used at PORT FAIRY. H&G 24. 1901 1d rose on white postal stationery wrapper addressed to UK & cancelled by '6' duplex with PORT FAIRY cds alongside dated JE.28.01. H&G24. 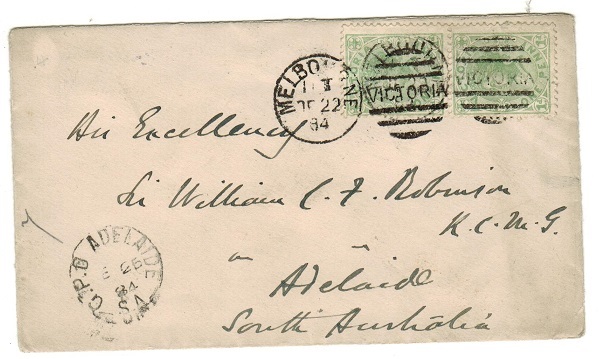 AUSTRALIA (Victoria) - 1895 1d blue postal stationery wrapper used at MELBOURNE. H&G 18. 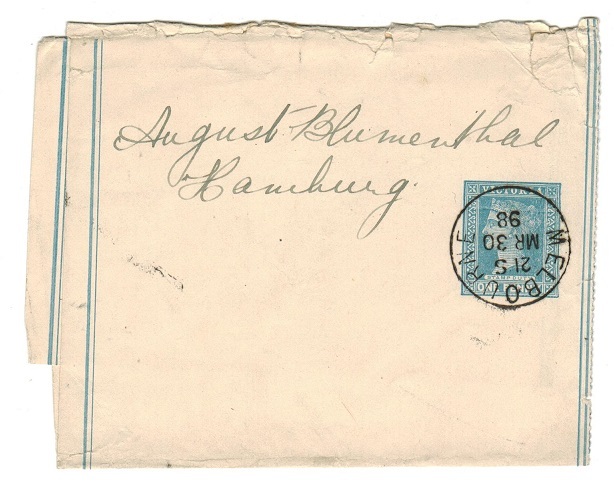 1895 1d blue on white postal stationery wrapper addressed locally & cancelled MELBOURNE & dated MR.30.98. H&G18. 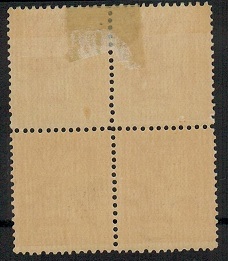 AUSTRALIA (Victoria) - 1887 1/2d postal stationery wrapper used at KERANG. H&G 15. 1887 1/2d Pink on white postal stationery wrapper addressed locally & tied by `207' duplex with KERANG/VICTORIA cds alongside dated AU.7.94. H&G15. AUSTRALIA (Victoria) - 1885 1/2d pink unused postal stationery wrapper. H&G 8. 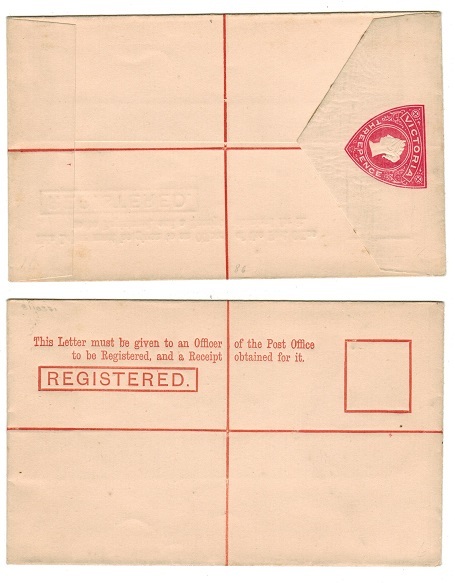 1885 1/2d pink on pale postal stationery wrapper with 'NSW' watermark & with border in fine unused condition. Scarce. (light folds). H&G8. AUSTRALIA (Victoria) 1871 1d green unused postal stationery wrapper. H&G 2. 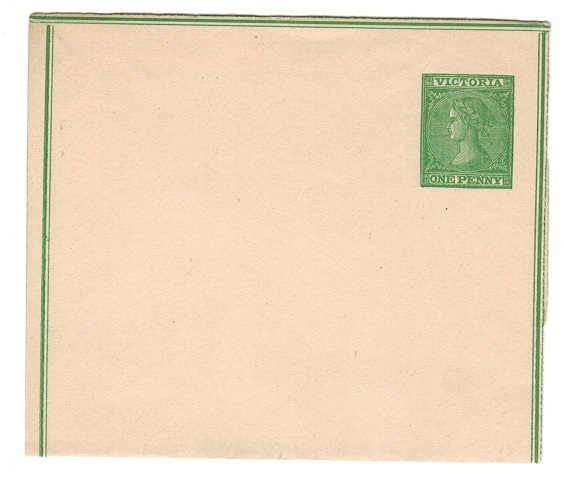 1871 1d Green on white postal stationery wrapper with border. Fine unused. H&G2. 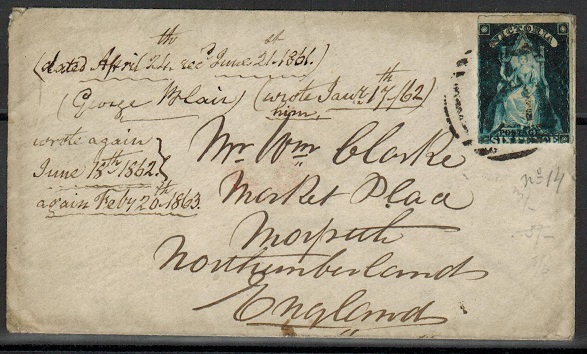 AUSTRALIA (Victoria) - 1867 6d rate cover to UK used at MORTLAKE. 1867 (AP.25.) 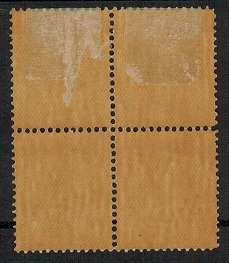 cover addressed to UK marked 'Via Southampton' bearing 6d grey-black (perf 12) adhesive (SG 107b) tied by '249' duplex cancel with very fine MORTLAKE/VICTORIA cds at left. AUSTRALIA (Victoria) - 1880 6d rate cover to UK used at YARRAM YARRAM. 1880 (JY.17.) 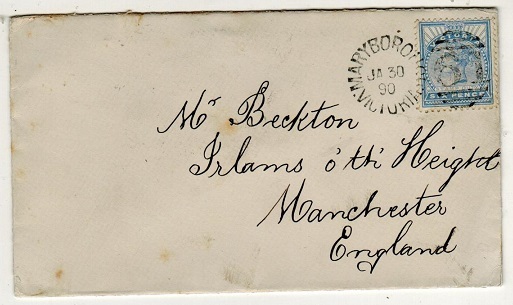 cover addressed to UK bearing 6d blue adhesive (SG 111) tied by '336' duplex with YARRAM YARRAM/VICTORIA cds below. 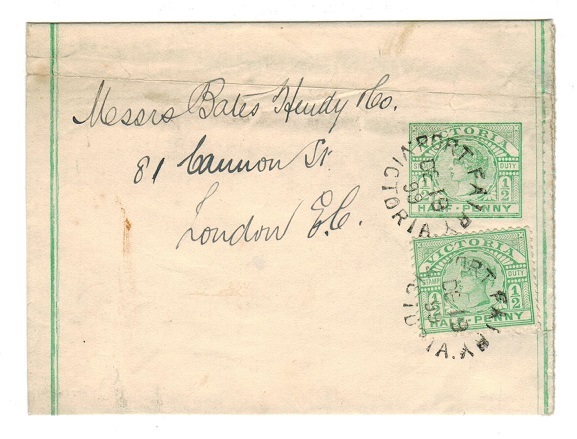 AUSTRALIA (Victoria) - 1889 use of THE TREASURY/VICTORIA/FRANK STAMP on cover to UK. 1889 (FE.8.) 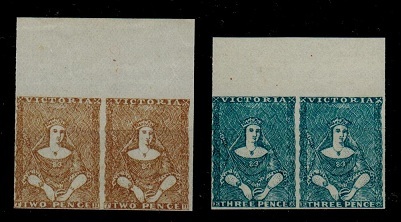 use of long blue stampless ON HER MAJESTYS SERVICE envelope addressed to UK with pre-printed crested THE TREASURY/VICTORIA/FRANK STAMP at left in black cancelled by VICTORIA barred duplex with MELBOURNE cds alongside. Australia (Victoria) - 1873 1/- blue on cream unused TELEGRAPH form. H&G 1. 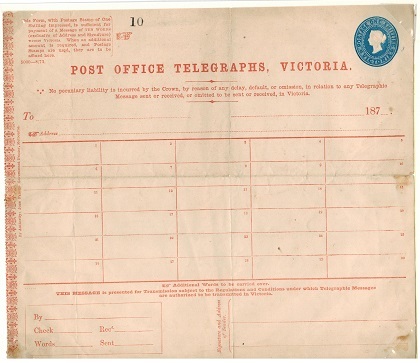 VICTORIA - 1873 1/- Blue on cream (red text) POST OFFICE TELEGRAPHS, VICTORIA telegram form in unused condition. Folded both vertically & horizontally but ironed out. Only 5000 forms were originally printed & few copies now exist. A very scarce piece of stationery. H&G1. 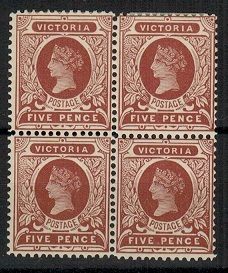 AUSTRALIA (Victoria) - 1900 5d reddish-brown mint block of four. SG 391. 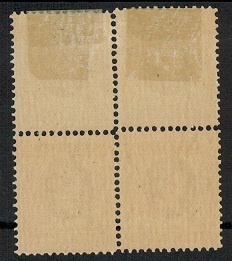 1900 5d Reddish brown in a fine mint block of four. SG 391. 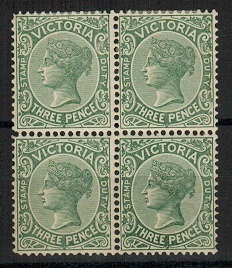 AUSTRALIA (Victoria) - 1901 3d slate green mint block of four. SG 362. 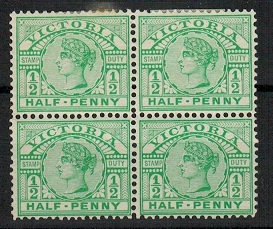 1901 3d slate green in a fine mint block of four. SG 362. AUSTRALIA (Victoria) - 1899 2d violet mint block of four. SG 359. 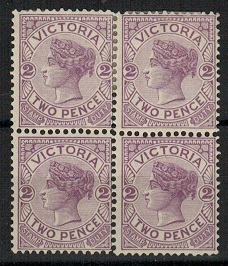 1899 2d Violet in a fine mint block of four. SG 359. 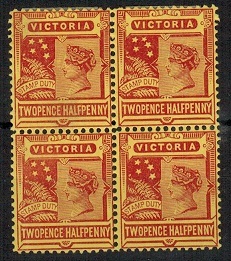 AUSTRALIA (Victoria) - 1892 2 1/2d brown-red on yellow mint block of four. SG 315a. 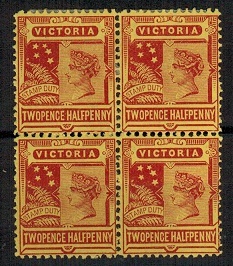 1892 2 1/2d Brown-red on yellow in a fine mint block of four. SG 315a. AUSTRALIA (Victoria) - 1900 1/- yellow mint block of four. SG 381. 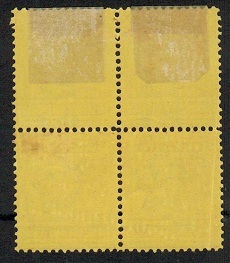 1900 1/- Yellow in a fine mint block of four. SG 381. 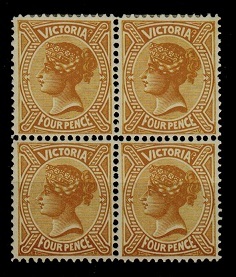 AUSTRALIA (Victoria) - 1900 4d bistre-yellow mint block of four. SG 379. 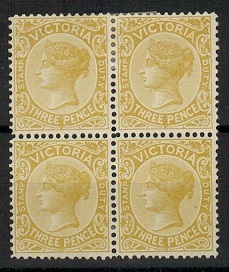 1900 4d Bistre-yellow in a very fine mint block of four SG 379. 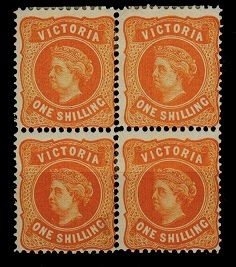 AUSTRALIA (Victoria) - 1900 3d dull orange mint block of four. SG 378. 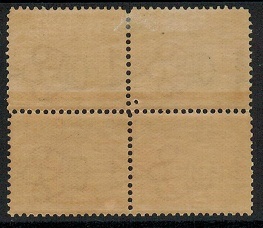 1900 3d Dull orange in a very fine mint block of four. SG 378. 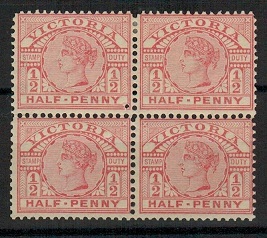 AUSTRALIA (Victoria) - 1899 5d red-brown mint block of four. SG 364. 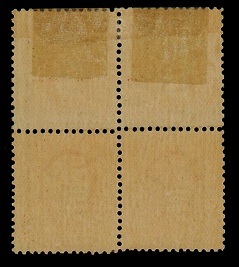 1899 5d Red-brown in a fine mint block of four. SG 364. AUSTRALIA (Victoria) - 1899 3d bistre-yellow mint block of four. SG 361. 1899 3d Bistre-yellow in a fine mint block of four. SG 361. 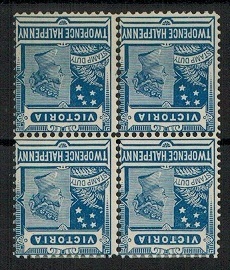 AUSTRALIA (Victoria) 1900 2 1/2d blue mint block of 4 with INVERTED WATERMARK. SG 360. 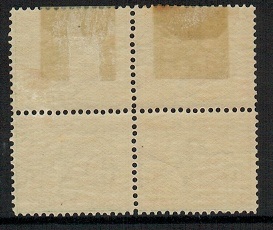 1900 2 1/2d Blue in a fine mint block of four with WATERMARK INVERTED. Unlisted by SG. SG 360. AUSTRALIA (Victoria) - 1899 1/2d emerald mint block of four. SG 356. 1899-1900 1/2d Emerald in a fine mint block of four. SG 356. 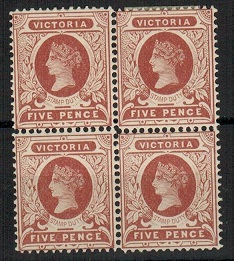 AUSTRALIA (Victoria) - 1900 1d rose red mint block of four. SG 357. 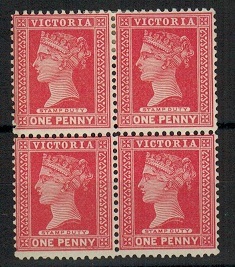 1900 1d Rose-red in a fine mint block of four. SG 357. AUSTRALIA (Victoria) - 1896 2d violet mint block of four. SG 334. 1896 2d Violet in a fine mint block of four. SG 334. AUSTRALIA (Victoria) 1897 1/2d carmine-rose mint block of four. SG 330a. 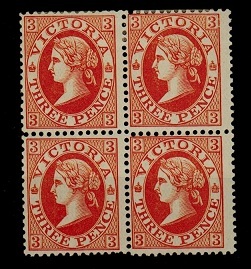 AUSTRALIA (Victoria) - 1893 2 1/2d red on yellow mint block of four. SG 315b. 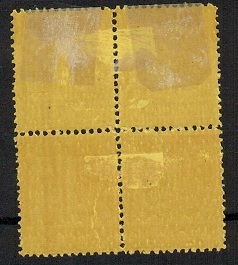 1893 2 1/2d Red on yellow in a fine mint block of four. SG 315b. 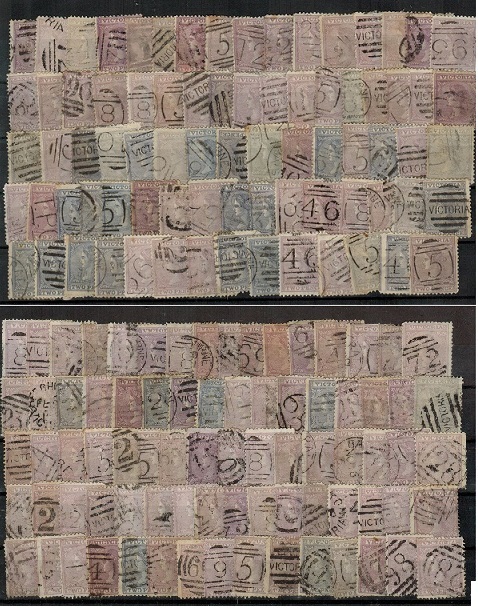 AUSTRALIA (Victoria) 1850 2d+3d 'half length' FORGERY pairs unused. 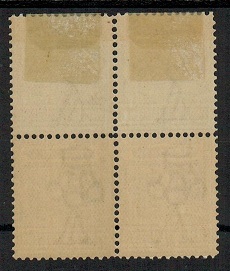 1850 2d and 3d 'half length' (SG type 10) FORGERIES in fine top marginal horizontal pairs printed on white ungummed paper. AUSTRALIA (Victoria) - 1908 1d rose AMERICAN FLEET PSC unused. H&G 30. 1908 1d rose 'American Fleet' postal stationery postcard in very fine unused condition. H&G 30. 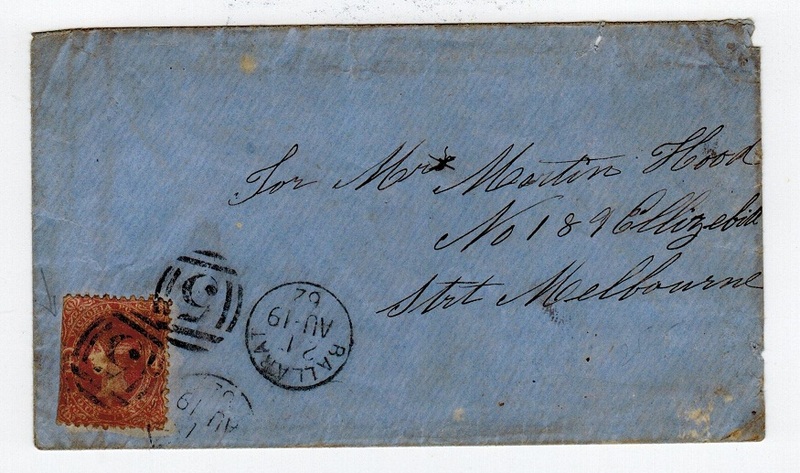 AUSTRALIA (Victoria) - 1856 8d Double rate 1/2 length cover to Geelong. 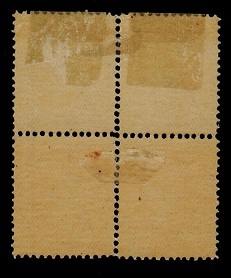 1856 (SE.5) use of outer wrapper addressed locally to Geelong bearing half length 1d pair & 3d pairs cancelled by large barred '15' numeral cancel (RL type C) of Bacchus Marsh & with black crown GEELONG/VICTORIA b/s's. The stamps cannot be guaranteed - take a close look. Double rate covers are however exceedingly scarce. AS IS. 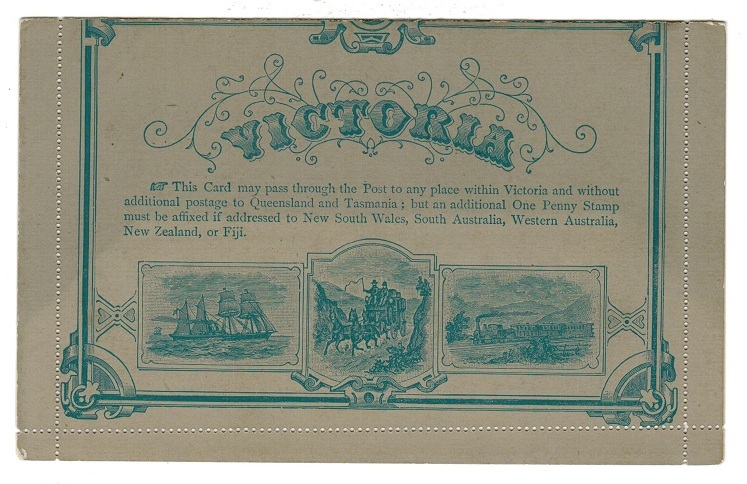 AUSTRALIA (Victoria) - 1890 1d 'illustrated' pictorial letter card unused. H&G 2a. 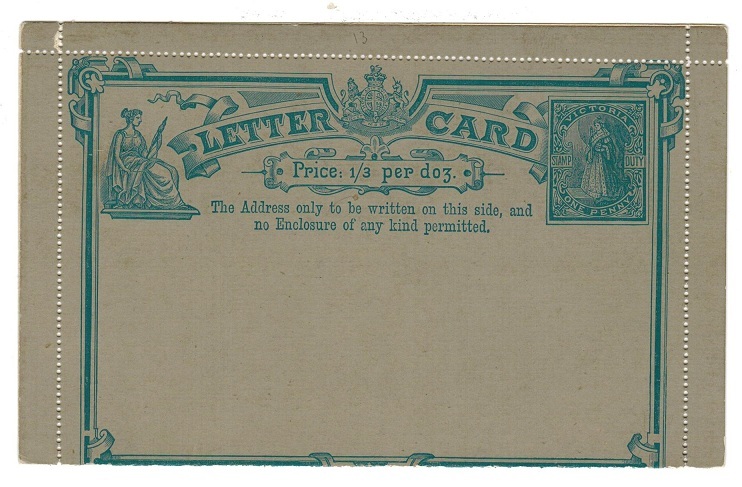 1890 1d blue on grey 'pictorial view' postal stationery letter card in unused condition. H&G 2a. 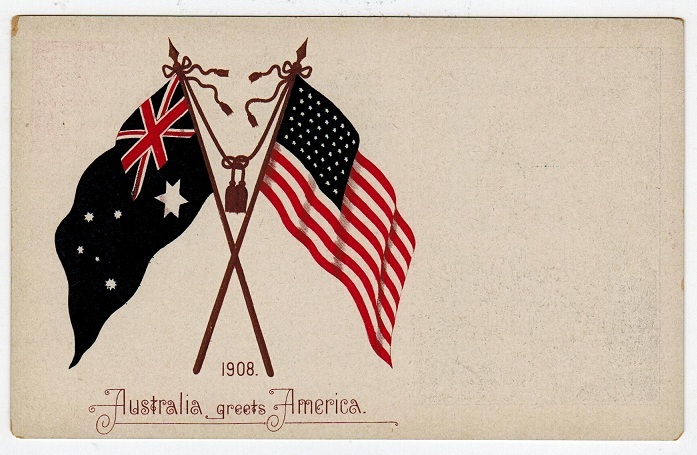 AUSTRALIA (Victoria) - 1908 1 1/2d PSC unused printed for AUSTRALIA GREETS AMERICANS. H&G 31. 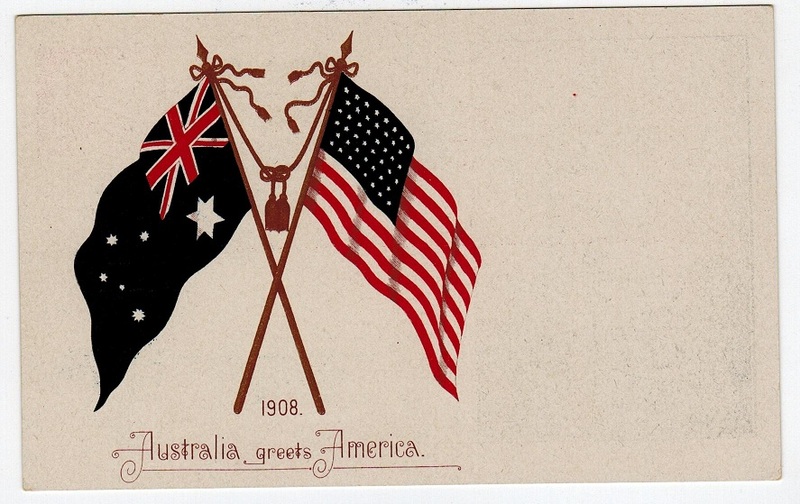 1908 1 1/2d red-brown on white postal stationery postcard in fine unused condition specially printed for the celebrationary visit of the Amercian fleet to Melbourne and showing the two flags crossed on reverse side headed 1908/Australia Greets America. Rated RRRR by H&G. H&G 31. 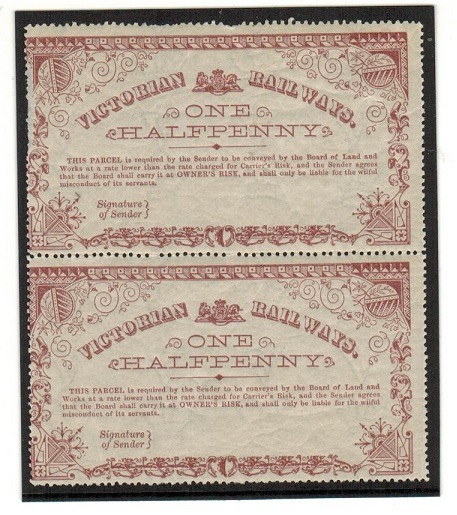 AUSTRALIA (Victoria) - 1895 1/2d PS wrapper uparted with additional 1/2d from BACCHUS MARSH. 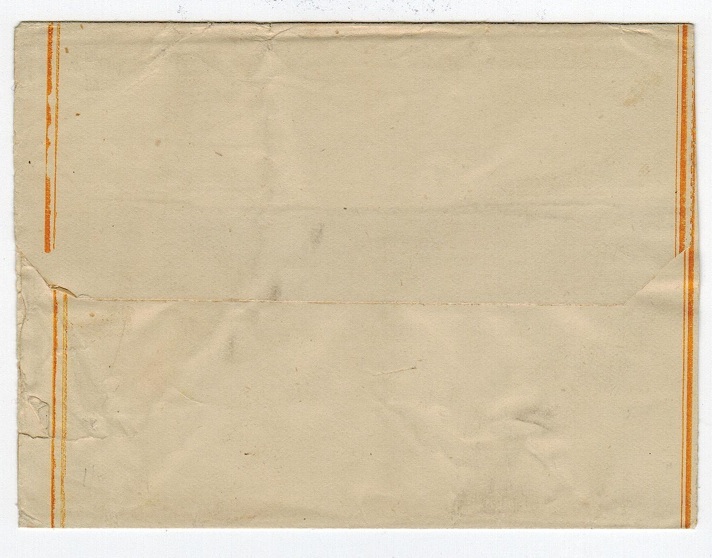 1895 1/2d Yellow on white postal stationery wrapper addressed locally & bearing additional 1/2d adhesive tied by '15' duplex with BACCHUS MARSH cds alongside dated 10.29.95. H&G 17. AUSTRALIA (Victoria) - 1862 4d local cover from BALLARAT. 1862 (AU.19.) 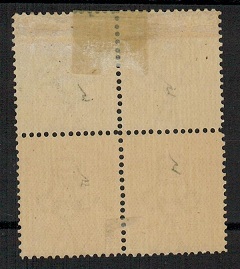 cover addressed locally to Melbourne bearing 4d dull rose adhesive (SG 92c - cut straight at left side) cancelled by '5' duplex with BALLARAT cds alongside.